Difficult to find plants/seeds locally or online…get them when you have the opportunity! This species is supposedly adaptable to a wide range of growing conditions, but this seems unlikely considering this milkweed is a rare find in the wild, let alone in nurseries. Since Asclepias purpurascens does not have a long tap root to store excess nutrients, I question reports of drought tolerance. Ours is planted in well-drained soil but it’s not overly dry. We mixed in composted manure before planting our purple milkweed last fall. Our plants will receive morning/early afternoon sun, but get a shady reprieve from the sizzling afternoon sun. Segregate purple from aggressive spreaders like common milkweed so your plants aren’t overcome by ravenous rhizomes. Protect your plants! Since these seem more difficult to establish consider putting up a fence to keep away small critters. We left ours up over winter and will leave it until the plants establish themselves next season. 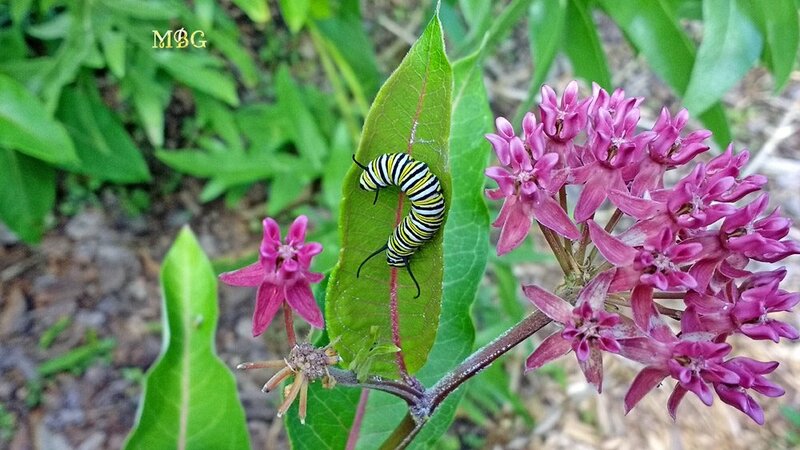 Cut I- If you don’t want additional seedlings next spring, simply cut off the seed pods before they pop open or bind them shut with twist ties or rubber bands if you want to collect purple milkweed seeds. 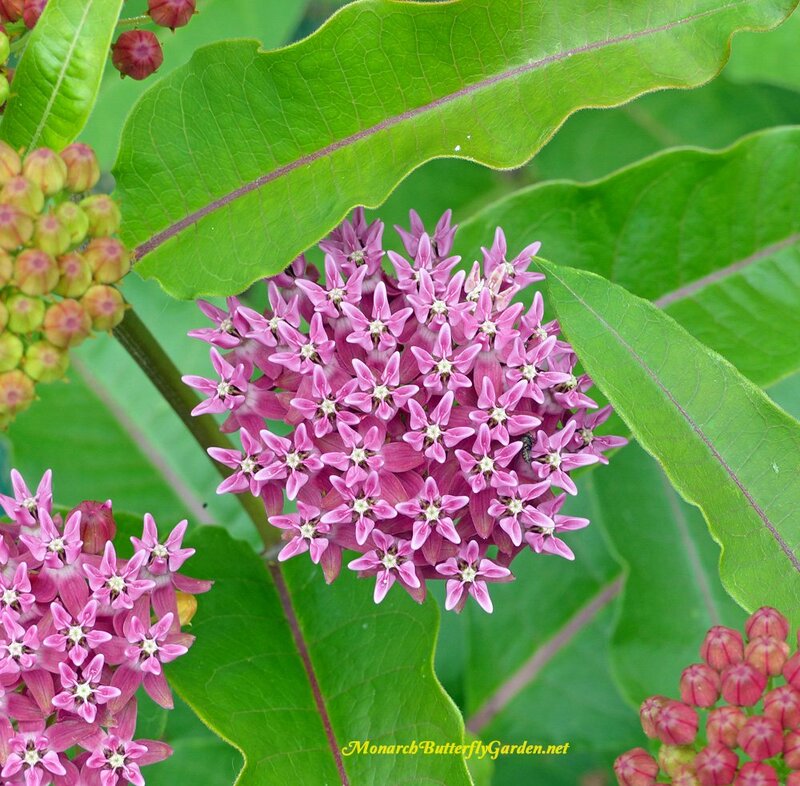 Check back for more updates (with photos) as we try to unlock the secrets of successfully growing Asclepias purpurascens. 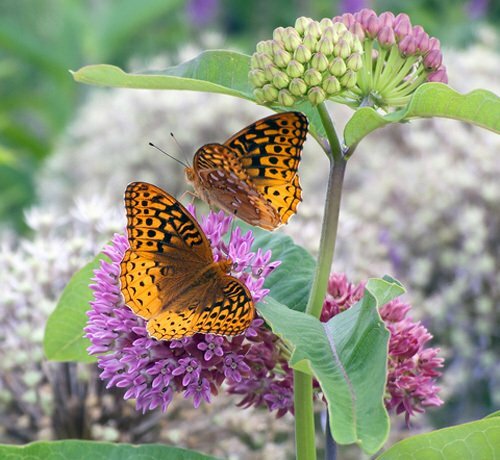 Please post below if you have any questions or comments about growing Asclepias purpurascens in your butterfly garden. I live in eastern Pa – do young purple milkweed have red stems? Everything else resembles the purple milkweed. Thank you! Can purple milkweed cuttings be placed in water to form roots? I planted 10 packets of seed and I got 30 plants which I planted in my local park in Alexandria, VA. I am hoping some may bloom as they are already a foot tall with all the warm weather and rain we’ve been having. I pinched half in the front to get them to be more bushy and realize they might not bloom this year. I can send you pictures to update you if they bloom. Would you recommend fertilizing them if you’re trying to get blooms? I am hoping to start a colony and they spread in the park because it is rare in the DC area. They are also on the top of a small hill and there is no water source so I can update you mid-summer on their drought tolerance. 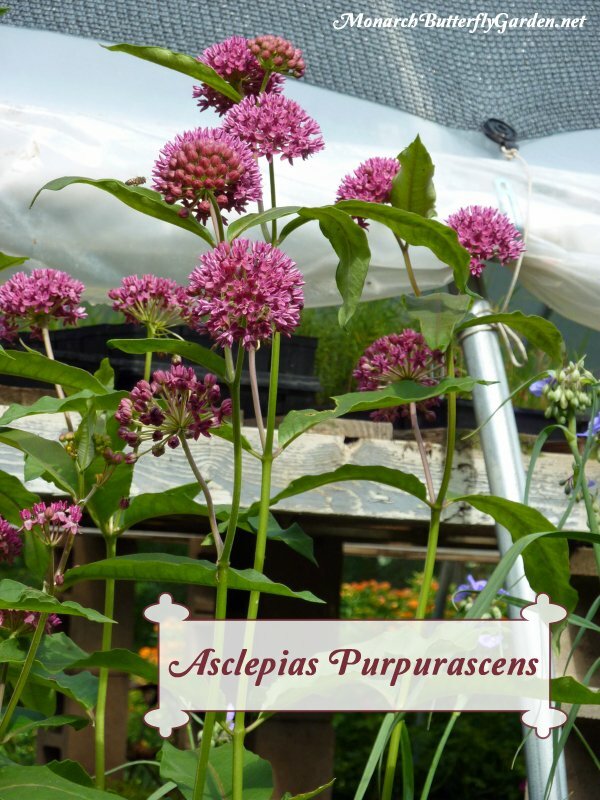 We live in Madison, Wisconsin, and were lucky enough to find and buy three Asclepias Purpurascens plants in 4″ pots last spring. We’ve been babying them along on a table on our deck, which gets sun all morning. We just read this entire thread, and are so glad we did! These plants were not inexpensive, and would hate to have lost them to wabbits! Anyway, Hubby had thought he should plant them today, July 2. It’s been a very mild summer so far, but I’m wondering, from reading this thread, if it’s wise to plan them in the ground in summer, or wait until fall. Thanks for your helpful site! Hi Jeri, I would probably plant them now. If you have rabbits, I would definitely put fencing around them…no matter when you plant them. good luck! This year is a good year for my Purple Milkweed. Not only does it look like it will bloom a second time, but I finally have a seed pod! I protected it! I have the perfect spot( morning sun, afternoon shade) but I need to till it first. I planted mine too close to the Common milkweed and the plants will need to be relocated as well. congrats on your purple milkweed Isabelle…protecting the pod is a good idea. I would suggest transplanting in fall…good luck! I was able to find some purple milkweed at a small, independent nursery this week, and remembered what you said about if you have the opportunity to buy this, to jump on it! So I did, and also bought a poke milkweed plant too. Can either of these be successfully grown in a pot for the 1st season and transplanted out next spring? Does both these varieties have roots like swamp mw? Hi Matt, I’m not sure what the advantage of potting them first would be? We ended up putting fencing around our patch because the rabbits ate it down twice. No matter when you plant, I recommend fencing if rabbits are a garden pest. I would pot them and plant late summer or early fall. Poke milkweed for sure. I planted seedlings four years ago that finally bloomed this year versus some I started last year and left in pots until August which also put out some blooms this year. Saved me two more years of waiting on them. Fire can be a valuable regeneration tool but must obviously be used with extreme caution. I planted a wildflower prairie on about 1.5 acres and it came in beautiful with awesome species components of various wildflower plants, warm season grasses and the attracted wildlife, perfect. Except the invasive non-native Japanese Stiltgrass that I did not know was already there. The only way to rid it from the dense field growth was; kill the entire field with herbicide for many years in a row, burn it and hope the heat would kill the seed bank of the Stiltgrass (the seeds remain viable in the soil for many years like many seeds do under normal conditions). Anyway, to shorten this story, I burned the field after waiting a few years for the perfect conditions in late February. Wow, the purple milkweed is exploding up this spring. Did I get lucky? Yes, in many ways. But my understanding is the heat will also help control many of the cool season grass and other undesirable components that have little if any value in such a prairie. ..extreme caution is highly advised. Anyone looking for purple milkweed in Ohio should check out Nodding Onion Gardens. They’re a pesticide free native plant nursery. Hi Robert, there are links at the bottom of this page. 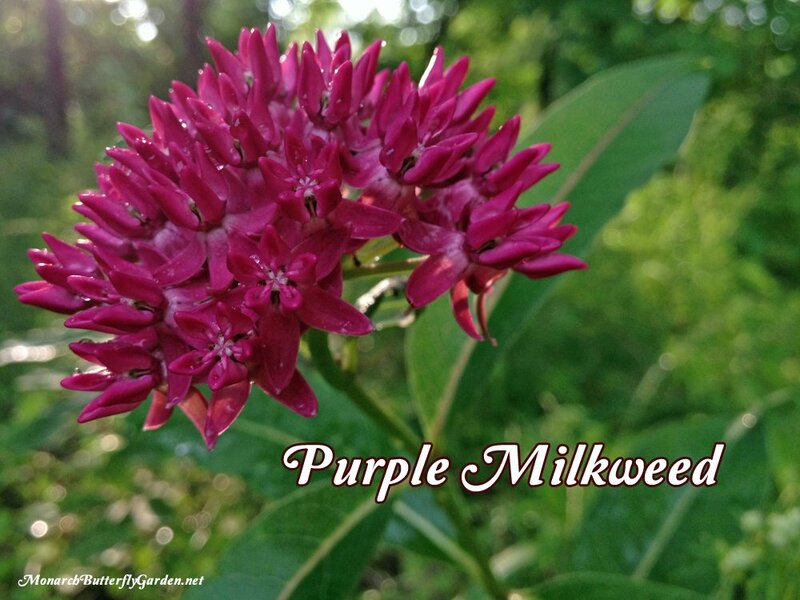 Unfortunately, purple milkweed is stingy with the seeds so it’s not always easy to find them. Prairie Moon Nursery for seeds, the best place. Also, try Etsy and eBay. Steer clear of growers from China. Make sure they come from the US. 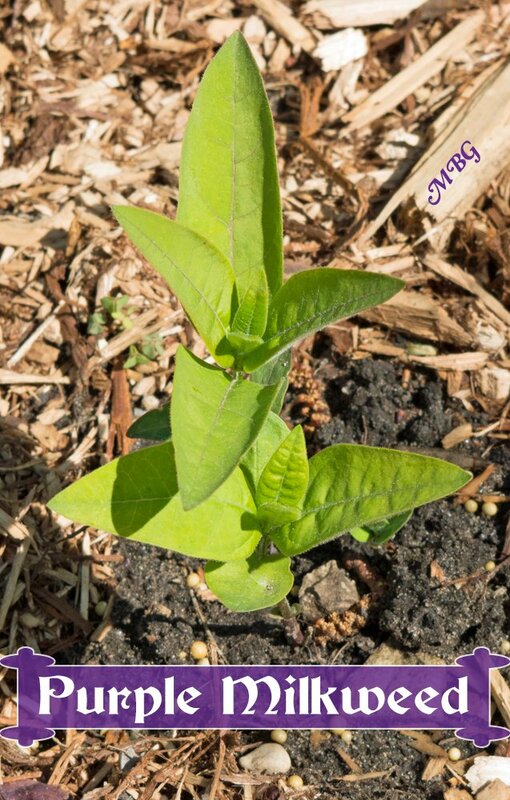 Tony – I was able to purchase several purple milkweed plants about a month ago. They are planted in two separate locations and are looking OK but seem to be growing very slowly. (Emphasis on “very.”) Am I impatient, or is A. purpurascens a slow grower? Hi Edward, it’s definitely a slow grower…ours didn’t flower for three years. But, it’s definitely worth the wait for an established patch. good luck! Purple milkweed must be a rabbit’s hot fudge sundae. I planted 5 that I got from my local nursery, and within three days they were devoured into little stubs by the rabbits. I’ve since sprayed some rabbit mace on and around the plants, which is keeping the rabbits away, and the purple milkweeds are all slowly recovering. Of course, no butterflies are going to want to come near the plants either. But first goal is to get the plants to survive and mature. I’ve had trouble with wascly wabbits in the past and I’ve learned to use metal fencing, preferably chicken wire so the little ones can’t get through. The darlings chewed right through the plastic and string rabbit fencing. Also good to burry it about 3 inches because the determined ones will dig unde otherwise. Bless their hearts. I would like to cut back my older milkweed to get new growth, but often when I cut back my common milkweed the stem turns yellow, withers and is gone. Should I cut off at ground level, or pull it. I am getting flowers right now. Perhaps I need to cut before it has flowers on it. Would like some advice. Also, some of my common milkweed is turning yellow. Not sure if it is Milkweed Yellows. I had pulling milkweed out of my garden. Hi Bonnie, there’s not really a ‘right’ answer to this. I’ve heard of people cutting back common before it starts to bud/flower so the growth cycle is delayed…we usually cut some back after it flowers. If your common starts to die after cutting it back, it could be a moisture issue. In Minnesota, our common milkweed generally starts to ‘go bad’ in August. It’s a much simpler solution to plant multiple varieties with different growth cycles. Our swamp and tropical milkweed stay viable much longer than the common. Hi Bonnie, I just realized I was giving you information about common milkweed on the A. purpurascens page. Purple milkweed seems to have a more specific growth cycle so I’m not going to risk “no seeding” by cutting back the plants. Once I have a good supply of seeds I will experiment to see how cutting back affects this particular species. I bought 12 purperescence seeds and followed directions to vernalize and scarify. All 12 germinated! I transferred them to large pots with decent soil and placed in the sun. The new leaves are yellow. I am worried about them. Do I need to find a place where they have afternoon sun? Hi Janet, you might try fertilizing them with a slow release fertilizer. Purple milkweed leaves have a yellowish tint compared to other varieties, and not sure why this is. You could always try growing some in a different location to see which microclimate of your garden they prefer…good luck! We live in Western Mass. and are blessed to have a large yard. Part of the yard is only mowed once a year to knock down the really gnarly stuff. Because of “life” taking over, we weren’t able to mow for two years. It became very dense and I found we were missing a great deal of wild life as well as most of our butterflies. We haven’t seen Monarchs for – you guessed it – two years. We were able to mow last fall and I have been working to turn it around. I was able to save several pods of seeds from the few milkweed that had managed to survive the over growth. I spread many of them around the location of the mother plants after we mowed. The seeds that I planted indoors managed to sprout but that was it. Happy to say mother nature did better as we have 15 plants about a foot tall. At least 4 or 5 will be mature plants with blossoms I pray. 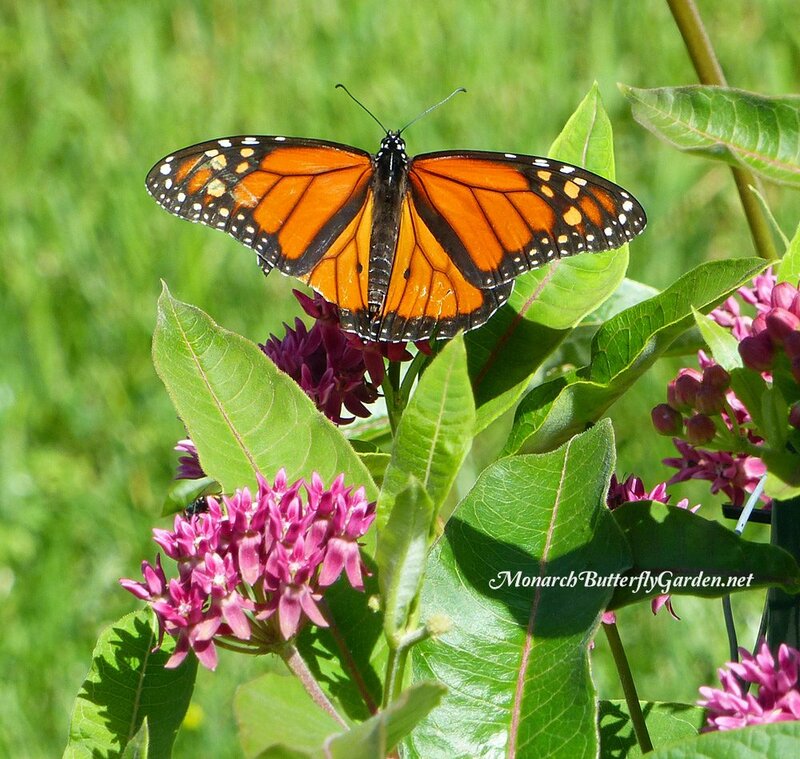 After all the information I have found this winter, I did read one article that said we should only plant the milkweed that is indigenous to our area as that is what our group of Monarchs are used to. Can you shed any light on this? Hi Shari, monarchs are a migratory species, and not native to one region. Native milkweed will typically support more local wildlife and should be easier to grow, though that is not always the case. We grow about 17 types of milkweed (native and non) and monarchs use them all at various points in the season. Each of the last 3 years our milkweed volunteers, which used to do well, have been overrun by what look like aphids / something that causes the pods to shrivel up. I’ve been at a loss to figure out a way to address the issues, that wouldn’t harm monarch / monarch caterpillars. Any ideas? We’re in Iowa City, Iowa. Maybe I should try growing some other varieties of milkweed. Good morning Tony. I was just reading comment from Marci Moss above, about “something” eating her purple MW seedlings inside a cage and I have to say I can understand. I have young Swamp plants that were 6 -7 inches tall, looking great…growing in half of a five gallon bucket, covered by a blanket of tulle “wedding veil”. I didn’t want any premature egg laying until I finally had some established plants. Appeared leaves were disappearing and sure enough, they were!!! ALL the leaves disappeared but the stalks are already shooting out new leaves. STILL under a layer of tulle!!! Wish me luck!!! Excellent job on this latest article. I’m still waiting for my Varigated tropical MW plants, I’ll keep you posted!!! Hi Gary, I hope you catch the culprit green-mouthed….good luck! And keep me posted on the variegated. It’s always interesting to hear about new and less planted milkweeds. I planted three purple seedlings last year. Something ate them all from inside the cages. This year, all three started coming back. Something ate 1 of them completely. So far 2 are doing okay. It must be some kind of bug. Hi Marci, rabbits kept eating our down to the ground last season, so we put rabbit fencing around ours and that solved the issue. Deer will also eat milkweed, but a rabbit fence wouldn’t work…good luck! I bought a purple milkweed plant last year. It hasn’t gotten much bigger but continually has beautiful magenta flowers! It should not grow here where I live since we have poor rocky soil, hot sun all day in summer. I feel blest , it is so beautiful. I have also found that gophers love these and will eat the whole plant. thanks for sharing your experience Sandra. As more people post throughout the site, the list of milkweed pests continues to grow! A fellow Arkansas gardener shared seed of this plant with you a year or two ago and she wonders if you had good luck germinating the seed. I have some old seed of this milkweed and pre-treated them as described on the Texas Native Seed Growers site and then put them out in a pot for winter sowing. Without thinking, I should have waited until colder weather arrived but it’s too late now! As you suggest, they suggest placing the seed in distilled water and chilling in the fridge for 24 hours, then draining and rinsing well with distilled water before providing the cold moist stratification required. Following this, pot up to germinate. Since I’m winter sowing, after rinsing with the distilled water, I just potted up in damp ProMix, put the cover on and set outside. Will let you know if I get any germination. The seed were packaged in 2010 so it’s doubtful I will get any to germinate but I had them so thought I’d give it a try. They have been stored in the fridge all these years so at least they’ve not been subjected to heat. My thanks for maintaining this very helpful site. I’m not sure how long milkweed seeds stay viable, but I don’t think 2010 is outside the realm of possibility for some germination…keep us posted and good luck! Hi Cecilia, I have not heard of this being grown successfully in your region, but if you tried it, I would recommend morning sun and afternoon shade. good luck and let us know how it goes! I have had purple milkweed growing in my native flower garden for about 5 years and it has grown from one plant to about 4 plants this year. There were 7 clusters of blooms on them this year. They get about 3 hours of sun around noon here in Springfield Missouri. The flowers in the bed are about 4.5 feet tall and so are the milkweeds. I do start some seeds in pots in the spring with fair luck. I have seen them growing wild in this area. I had to replace some milkweed this spring. I took a trip to the open house & plant sale at Monarch Watch in Lawrence KS in early May – it is a 350 mile drive from St. Louis but worth it as they always have thousands of plants for sale. They had purple milkweed so I bought some – we’ll see how it does. I bought several swamp milkweed, including the “Icy Ballet”. I now have a question. I have often read that in order for bushier growth the milkweed should be cut back. I have not ever done this & would like to try it. My plants are now one & two feet high. How far back should this be done & where on the plant? Am thinking since I don’t have the monarchs until August, September & early October on their southern migration there should be plenty of time for new growth…….. I also want to note that it was the common milkweed that killed off a lot in my garden so I pulled it all out in April. One shoot popped up in May so I yanked it out & stuck it in a pot of soil. It dropped it’s leaves & now there are new buds where the leaves were. I guess it is happy in the pot! Hi Dottie, if you cut back tropical it will grow out bushier, but not sure this is true for native milkweed. Our ‘ice ballet’ swamp put out 8 stalks this year without cutting back and the butterfly weed is very bushy this year without cutting back too. You might try an experiment by cutting some back and seeing if you notice a difference. I tried this with swan this year and all it seemed to do was slow down the growth…I may have done it too early though. After seedlings have reached 8-12″ you can cut back the top set of leaves. Glad your common is working out in a container! How do I get purple milkweed seeds? I germinated one purple milkweed seedling and bought two others and yes they have little cages around them as the rabbits are very fond of milkweed which I thought was poisonous but must not bother rabbits. Hope they bloom next year. Sounds like it may not be as cold in Indiana as Minn. Hope this helps. Thanks Brian, we had rabbits munching on purple, poke, and butterfly weed. Hopefully they will be less enthusiastic about more mature plants next season. Keep us posted on your purple and good luck! I’m interested in the purple milkweed, preferably seeds. I was wondering if they would be a good choice for where I live, 30 km northwest of Toronto, Ontario, Canada. Or should I just plant the common milkweed? My main goal is to establish a Butterfly Garden, which is highly visible from all directions, especially the Monarchs of which we see precious few here as of the last few years. I also have a butterfly house and wondered if butterflies actually use these? Thanks! Another great post. 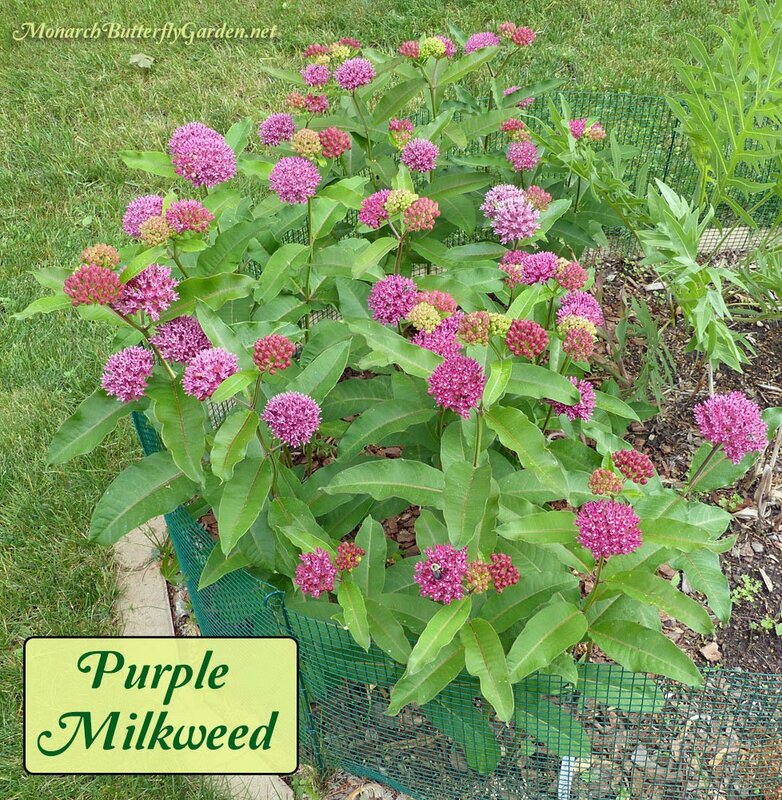 I planted purple milkweed last summer in a site similar to yours and it did well. The pollinators do enjoy it. It did develop seeds which I planted this fall. I have a local source in NE Ohio, Nodding Onion Gardens, which specializes in purple and poke milkweed. They also offer swamp and butterfly milkweed. They sell plants in gallon containers for $5. Hi Katie, I don’t often see purple milkweed plants for sale online. Your best options are to find a local nursery offering it or starting seeds…good luck!